Successfully Added Land Cruiser - Luxury 4.3 Inch Touchscreen GPS Navigator to your Shopping Cart. Even wealthy people need GPS. Introducing the all new Land Cruiser - Luxury 4.3 Inch Touchscreen Portable GPS Navigator . Impeccably designed, compatible with today's hottest GPS software titles, and full-featured, this is one priceless portable navigation unit! Impeccably Designed - Sleek and compact, all black exterior, perfect with a pair of Armani jeans or a Versace tuxedo. If you're the type of individual for which products must look as well as they function, congratulations The Land Cruiser was made especially for you. Let's say you're strolling down Saville Row and look for a particular store. With the Land Cruiser in hand, you're just a voice direction away from a couple of new bespoke suits. Equally at home in your Land Rover automobile, the in car cradle makes The Land Cruiser the perfect car GPS device! Elite GPS Device - The Land Cruiser features Windows CE 6.0, the operating system of choice for today's hottest GPS software and maps. Whether you're buying original or downloading from the web, this baby will give you access to today's hottest navigation features like: lane assist, voice guidance, and intelligent route planning. The choice is yours, get The Land Cruiser or get lost. Feature-Rich - The Land Cruiser is also an outstanding multimedia player that effortlessly handles the following popular file formats: XVID, AVI, MP4, MPG, MP3, WMA, BMP, and JPG! Listen to your favorite songs or watch your favorite shows like Gossip Girl, The O.C., or Desperate Housewives. You'll never be bored with The Land Cruiser in hand. The Land Cruiser is in stock now and ready for immediate shipment. Place your bulk orders today and make a great resale profit for your online or retail business. 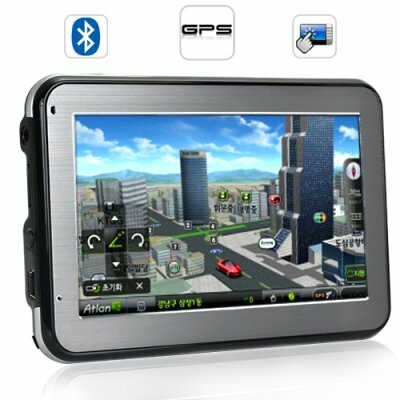 The Land Cruiser GPS device is presented to you by the leader in wholesale electronics, Chinavasion! Lots of extra features like Date and Time Function, Calculator, Backlight, Unit Converter (length, mass, capacity, area, angles, power, pressure, speed, temperature), and many games too! You don't have to pay to use GPS. The satellites which transmit GPS coordinates are maintained by the US government. You just need a GPS receiver to take advantage of the data. The Land Cruiser - Luxury 4.3 Inch Touchscreen GPS Navigator contains a top of the line GPS receiver. Very good. I bought another one six month ago. I broke it's LCD screen by accident. It's very good GPS.